Sealing, coatings and spray foam. At first, this option might seem the least expensive by resealing exposed seams or applying a waterproof coating. More often, these are only a temporary cure. 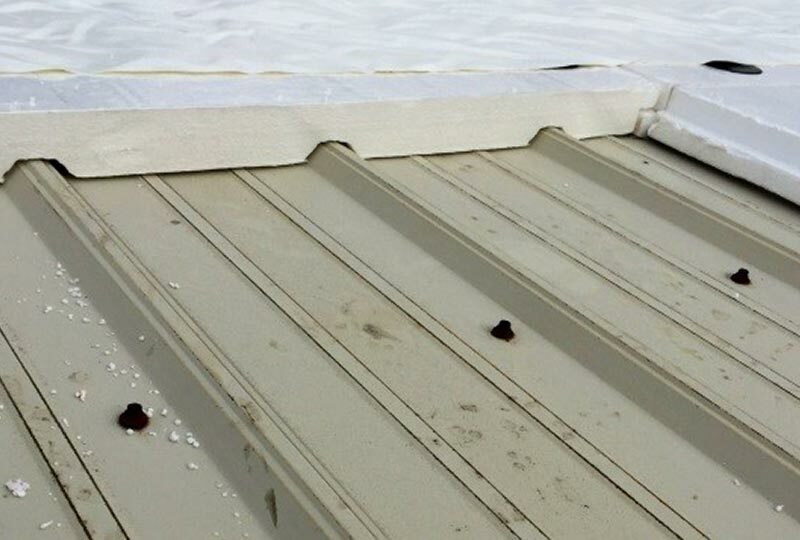 That’s because your roof continues to expand and contract, eventually rupturing the new seals and the coating. Coating systems also require proper service preparation and are only as good as the surface to which they are being applied. Most coating systems are difficult to apply in humid or damp conditions. Most coating systems must be applied with special protective equipment and produces noxious fumes. There is a risk overspray for most applications. Another more costly option is to completely replace the roof with new insulation and new steel. This option involves the use of heavy equipment that is disruptive to a building’s normal operations because it requires exposing the building’s contents to the elements while work is performed. In many areas, the use of metal over a metal roofing system requires engineering. This also reduces the original design snow load capacity. More often, less expensive, thinner-gauge metal is used, then the cycle just begins all over again, at a faster rate. The Duro-Last Roofing System, installed by Umbrella Roofing Systems, Inc., is a customized, perfect retro-fit to your existing metal roof because it’s a real roof - NOT a coating. The Duro-Shield roofing system is applied directly over your existing metal deck. (NO expensive tear-off is required.) Insulation is placed to fill in the flutes to ensure a flat surface and to increase the R-value. 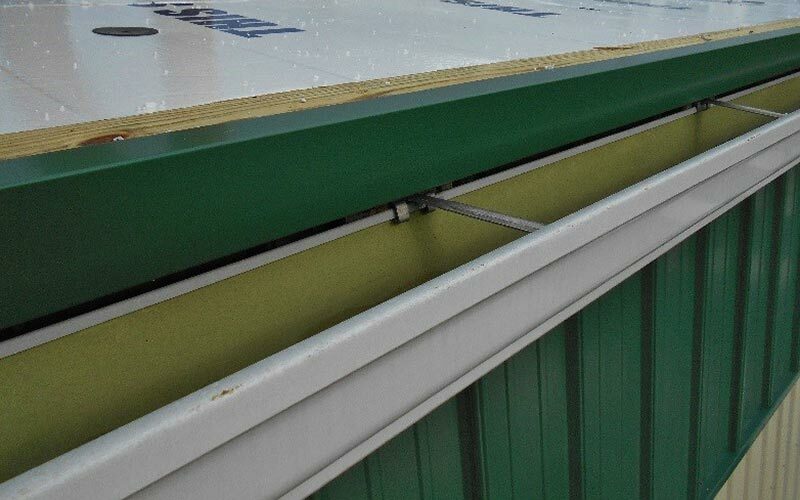 Then, the Duro-Last prefabricated membrane is mechanically fastened to the deck over the insulation. Prefabricated flashing for stacks and penetrations are heat welded to the membrane to create a monolithic covering to ensure a leak-proof seal. 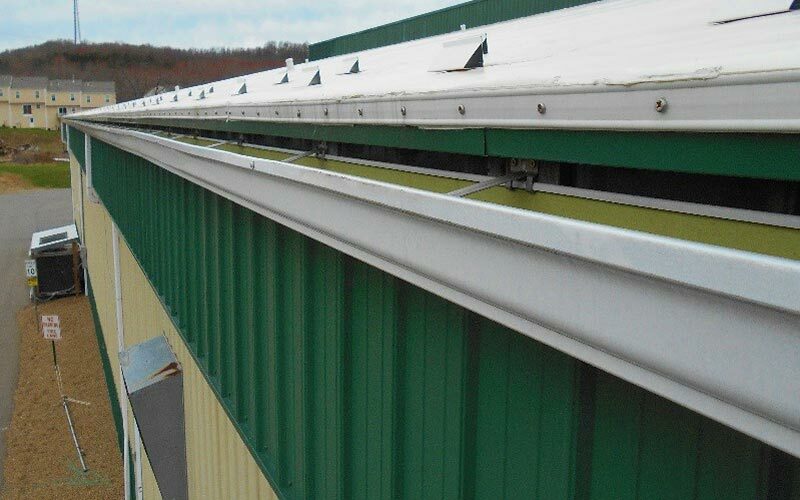 The roof is terminated over the edge using a galvanized C-channel and termination bar. 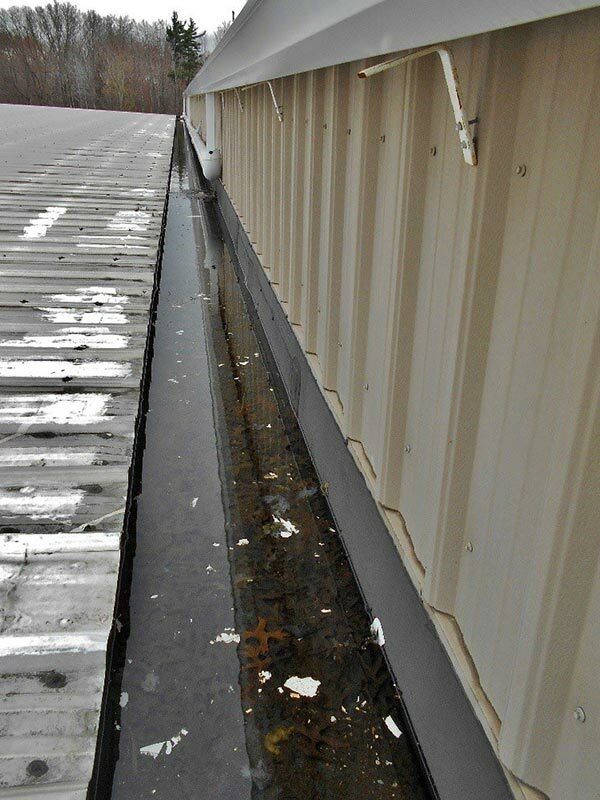 Where they exist, internal gutters are one of the most troublesome areas on a metal roof. In the summer months, they often drip on the inside, due to condensation. As the cooler water vapor in the building comes in contact with the warmer gutter, condensation occurs. Most internal gutters are uninsulated and designed to let inside warmer air heat them so that they will not freeze. However, more often than not, they still freeze in the winter. They then fill with ice and snow. After a warm-up, water melting from the snow can’t drain properly. This can create an ice dam. 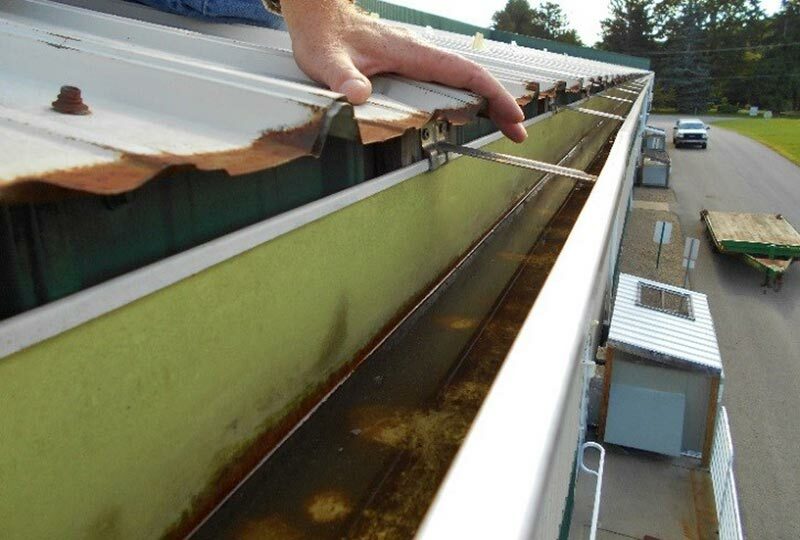 The water level may rise high enough to infiltrate in to the building between the gutter and the metal roof. The closer strips, which are made of foam, and are not designed to be water-proof. To remedy this internal gutter problem, we first line the existing internal gutter with a low R-value insulation layer. We then install a Duro-Last membrane in to the gutter. 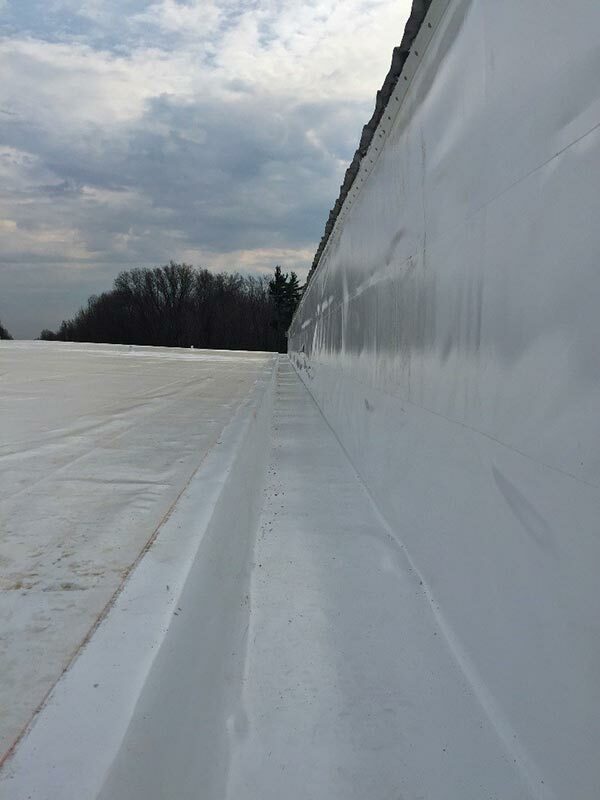 This gutter liner is heat-welded to both the wall flashing and the prefabricated Duro-Last membrane deck sheets to form one continuous membrane on the roof, into the gutter and up the wall. This solution eliminates any possibility of water penetrating in to the building at the internal gutter and wall. This entire installation is covered under warranty.